With his app "Doorman," Zander Adell is hoping to eliminate the need for slips like these. CHICAGO — Online shopping is exploding as a share of retail sales in the United States, which means doorman-less city dwellers are more frequently crossing their fingers in hopes their packages will arrive safely. According to Zander Adell, the "last mile" of the $320 billion e-commerce industry — home delivery — is still hopelessly outdated. With an app fresh out of Silicon Valley, Adell is hoping to bring Chicagoans a better option. Launched in San Francisco in 2013, Doorman helps users schedule personalized package deliveries so they don't have to face the choice between missing daytime deliveries and risking theft. After months of beta testing, the app marked its official Chicago launch earlier this month. "Almost everything has been solved within e-commerce, and people are realizing that it's generally an easier way to get stuff, but those solutions just haven't reached the delivery experience yet," Adell said. "It can be really frustrating for people living in a city who don't have a doorman, and we really believe the growing number of Chicagoans who shop online are looking for a solution." In a city seeing a surge in package theft, Adell is hoping his app can ease stress for nervous e-buyers and deter opportunistic burglars who translate "Sorry we missed you" slips into "Come on in, no one's home." Here's how Doorman works: Users are given the address of a warehouse that they use as the shipping address during online checkout. Once the package arrives at the warehouse, customers are notified, and they arrange for a driver to drop it off at their home at a time that's convenient for them. Adell said between 20 and 50 percent of packages in Chicago fail in their first delivery, either because no one is home to sign for them, or because they're left out and stolen. "We want to make that first attempt work every single time," Adell said. 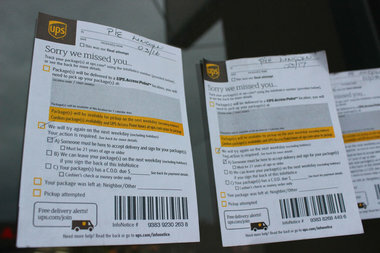 It didn't work for Adam Kluck, who had a package stolen from his Uptown apartment last year. So when he saw Adell pitch Doorman on "Shark Tank" earlier this year, he sprang at the chance to try the app for himself. Kluck signed up to be a beta tester, and it immediately came through for him. "I needed to have a diamond ring delivered for my wedding, and that's not something you can just have dropped off," Kluck said. "I would have had to spend an entire day to take a cab out to the UPS factory and pick it up on my own time. So [Doorman] was the absolute perfect solution." Doorman users have an option between a la cart use, which would come to $3.99 per delivery, or becoming a regular customer. Those users would pay $19 or $29 per month, depending on whether they want their packages delivered within a two-hour or one-hour window. For someone like Kluck, who said he generally makes online purchases several times a month, the service is well worth the cost. "For anyone like me who works a 9-to-5 job and is tired of having to get packages delivered to their office or drive to pick them up at factories, this is just a really awesome solution if you can afford the couple extra bucks," Kluck said. "For a lot of the buildings in Chicago, especially the two-flats and three-flats like mine, I see a real value here."